For 2014, Homer's Coffee House has decided to discontinue Pickin' on the Patio. It has been a great ten years. A big thanks to everyone who has been involved. Pickin' on the Patio was a weekly open-mic jam session hosted by Homer's Coffee House, 80th & Metcalf in Overland Park, Kansas. The group met every Monday night between Memorial Day and Labor day at 7:30. We began in 2003, so we are into our eighth season. The hostess was Theresa Kaat-Wohlert who did a great job of keeping things moving and assuring that everyone who wants to play had a chance. Her husband Bob, is a musical giant who will gladly give a free music lesson when asked, and helps keep everybody in time and on key. Jim Mathis plays the dobro and was the initiator of this summer event. Jim founded Homer’s in 2001 and patterned Pickin' on the Patio after an event his father hosted in the 1950’s. Jim is no longer involved with managing Homer’s and volunteers his time with two of his band mates on Monday nights to make a successful event happen. The band members of Sky Blue consist of Jim Mathis, Theresa Kaat-Wohlert, Bob Kaat-Wohlert and Wes Burrows. 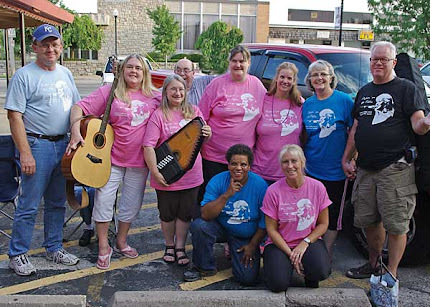 The puprose of Pickin' on the Patio was first, to have a good time; and then to develop friendships and relationships to encourage one another and build one another up. In the process we hoped to encourage talent and build musical skills. The 9th season for Pickin' on the Patio is fast approaching. The first night will be Monday, June 4, 2012. I am sure that you all have some tunes ready to perform for the folks, so we will see you in a few weeks.